The snap closures on the outerwear jackets contain excessive amounts of lead. 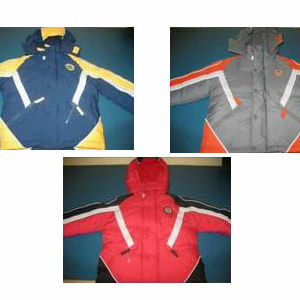 This recall involves about 8,000 boys' outerwear jackets with a Carter's-brand logo on the front. The jackets were sold in toddlers' and boys' sizes. Toddler sizes range from 2T to 4T. Boys' sizes include S, M, and L. The outerwear jackets were sold in charcoal, navy, and red. Major department stores and discount department stores nationwide from October 2006 through November 2006 for up to $50. Stop using the jackets immediately and contact Samara Brothers to obtain a full refund. For more information, please contact Samara Brothers at (800) 985-9975 between 8:30 a.m. and 5 p.m. ET Monday through Friday, visit their Web site at www.samarajacketrecall.com, or e-mail info@samararecall.com.